Magnetics are the "new and improved" crackles. Don't you think? Every brand has been releasing them and if I could try each and every one, I definitely would! They offer numerous effects and can even be worn "un-magnetized" for a regular look. Plus, they're often one coaters! 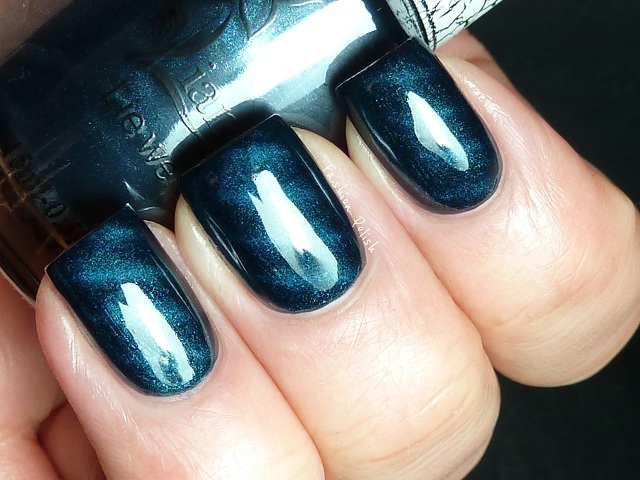 Born Pretty Store magnetic Blue 016 is a beautiful dark blue shimmer that's absolutely gorgeous on its own. Formula was flawless and applied like a dream in one coat , smooth, even and opaque. 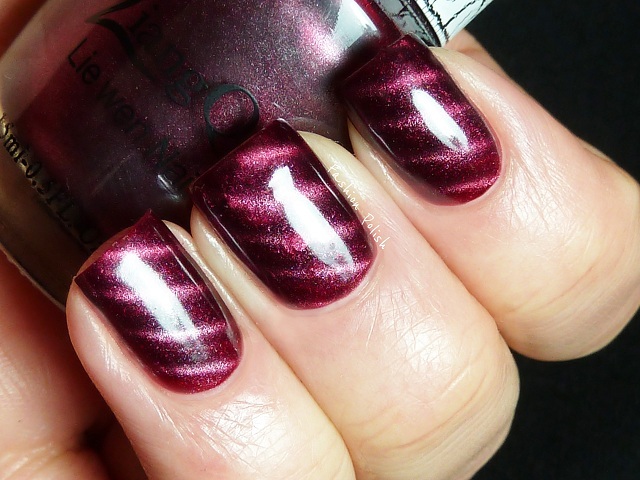 Born Pretty Store magnetic Red 05 is actually a dark magenta-burgundy red. Formula was just as perfect as blue 016, you're looking at one coat. Born Pretty Store Glitter Gray B32 is a gorgeous glitter made of small gold particles as well as red and turquoise round glitters. It applied nicely and evenly and would require 3 coats for a complete coverage. I used one coat over black in this swatch. Magnetic Blue 016 and Magnetic Red 05 both came with a strong diagonal stripe magnet. They retail for $6.38 each (15ml, 0.53 fl oz). Glitter Gray B32 retails for $3.51 (8ml, 0.27fl oz). Warning : They have a strong chemical scent and don't seem to be B3F. You can either visit the individual products pages by clicking on their links or directly visit Born Pretty Store here. Don't forget to enter S10X31 during checkout for 10% OFF discount, valid until Sep13th. 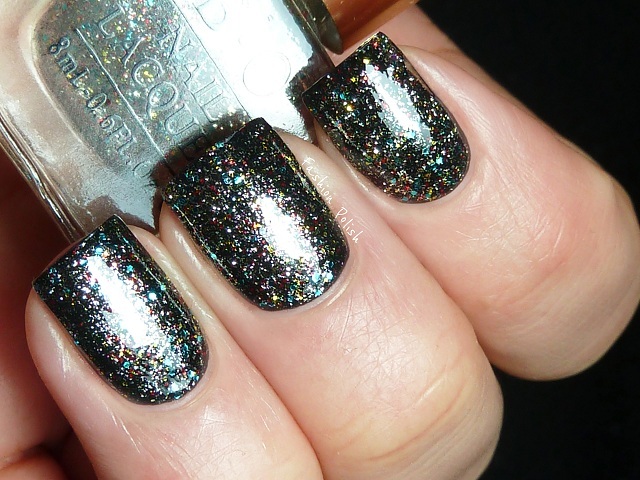 Wow, all of these are pretty awesome :O) Plus that is a really good price for magnetic polishes! They have to be 3 Free to sell in the US. Like with the crackles, I am over the magnetics now too - it was a fast been there, done that for me. All the brands need to feature about the same shades. Only certain pigments will show the effects. And all them magnetize to a murky shade of the color base. Wow looks great in the pictures! I really like Born Pretty Store. I love magnetic polishes, and those ones are such a pretty colour! I haven't bought any magnetic polishes yet, it hasn't quite caught me enough for me to spend money on it. Having said that - your pics are gorgeous!! Oooh That glitter looks so pretty! That glitter looks super interesting! Both of those magnetic colors are gorgeous! So rich and saturated. And I pretty much have to have every multi-color glitter I come across. I was planning on making a Born Pretty order in the near future so I think my list just got a bit longer. Great pics!